The final countdown has begun, and in a few hours the 2019 Boat Races will draw hundreds of thousands to the history-riddled banks of the tidal Thames. Rower supporters are pulling out their most impressive kit to keep them warm on the chilly Embankment: alumni and alumnae digging out anything they can find which is the right shade for their university (Pantone 282 for Oxford and Pantone 557 for Cambridge, in the azure and spring green colour ranges respectively). There are dozens of stories in any Oxford-Cambridge Boat Race. They range from the keen college rower who trialled unsuccessfully, to the cox who made it into the reserves at the last minute, to the experienced Blue gearing up for their nth race. Some are unseen by the world’s media, such as assistant coaches (some doing it for decades), launch drivers, spare pairs, nervous parents, and those who volunteer year after year to help officiate and make the event work on the day. But the generations have come together this year in one rather neat story, that of the Dark-Blue-hearted Pearson family. One half of the story is Charlie Pearson, a former Etonian and junior worlds medallist who will race at bow in the Oxford Blue Boat on Sunday, combining training with the time-consuming study of engineering. The other half of the tale features his father Adam, who 25 years and two weeks ago was preparing to sit at 5 in the 1994 Oxford crew. Adam had been carrying a cold for most of the winter, and since he was in his last year at university, and his first to see success in the Oxford squad, probably tried to ignore the messages his body was sending him. But breathlessness while training with a fortnight to go sent him to the doctors who confirmed that his heart was inflamed, probably a result of the virus. “You’ll be OK in 2-3 weeks, but you can’t race”, they told him. And that was it, his chance at rowing history, gone. Barring a bit of rowing immediately after university Adam left the sport — only able to cheer from the side-lines as his two rowing sons won — but re-joined it in 2016 and after getting back to form with Molesey and their famous Leg-End crew, got into the Oxford boat for the Veterans’ Boat Race. And on Saturday the veteran Dark Blues, with Adam on board, beat their Light Blue rivals by just under a length. An omen perhaps? Unlikely — this year, as last, Cambridge are bookies’ favourites and while there are weak spots, Oxford’s men and women would both need a bit of luck to win. Cambridge’s women and men have a little bit more power within each stroke, and while there is a noticeably bouncy finish in all the Light Blue boats (the Dark Blues looking smoother), if they can keep each stroke connected better than Oxford there’s a good possibility they can make the weight and power count. 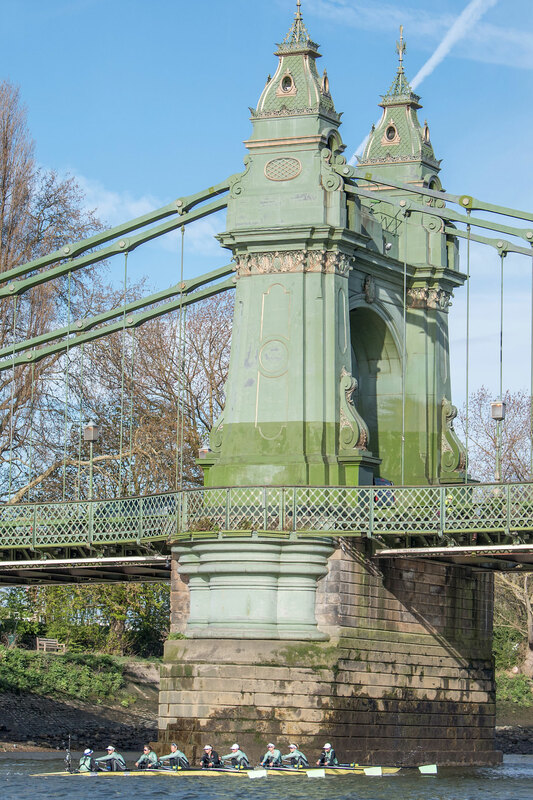 The differentials are 2lb 9oz average in weight, 1 inch average in height and a year’s difference in age to Cambridge for the women, and 5lb weight plus 4 years seven months average age difference to Cambridge for the men (no height difference). The style difference is very obvious, making those of us who have been watching the races for the last couple of decades think ‘hang on, isn’t this the 1990s in reverse?’. All the crews move faster up the slide than their older alumni will think sensible, but that’s a product of the latest style thinking, and it’s going to be more how they keep their rhythm in the rough water which will matter on the Tideway. Even though the wind is predicted to be light and ENE (ie right behind the crews at the start), the open water especially around the Milepost and Bandstand can feel uneven and wobbly. Here all four of them have had good and bad days, but the Cambridge men’s tandem rig between 6 and 7 may prove the most vulnerable to the odd bad stroke. Ah yes, the tandem. It’s what you might call a brave choice by coach Rob Baker, given that if the tandem’s rhythm is disrupted then it could shake up the whole boat’s confidence, being in the stern unit. When questioned at the press conference he explained that it just made sense in terms of how the boat’s rhythm worked, but nevertheless there are rumours that if they win the toss Cambridge may choose Surrey simply to avoid any chance of a clash on that side. 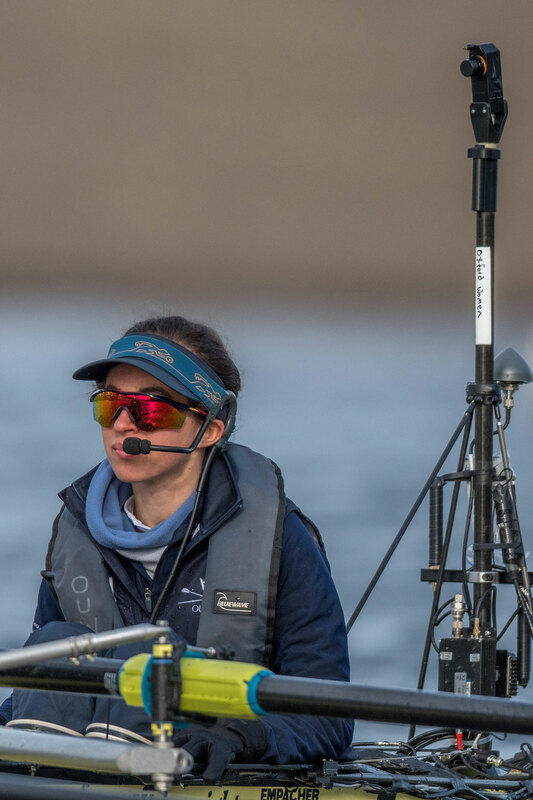 However, that would put stroke Natan Wegryzki-Syzmczyk into the zone with Oxford, and as his two-man James Cracknell told Row360 three weeks ago, Natan hates clashing. Unfortunately, if cox Matthew Holland’s determination during the CUBC-Brookes fixture was anything to go by, clashes may well be on the menu — it was during that fixture that it was demonstrated just how wrong it can go when a tandem hits a clash. Holland is up against a cox who is probably the least experienced steersman for Oxford in a hundred years: Toby de Mendonca. Having rowed as a college novice in his first year, Mendonca tried a little bit of coxing in his second year (that was 2017-18) but didn’t start properly coxing full-time until just over a year ago, so has clearly learned quickly and well. The question for Oxford supporters will be, can de Mendonca stay calm and get it right when in the thick of battle, when his biggest race to date has been coxing the college first eight in bumps. Bumps is very high pressure, but there are more people making more mistakes around you, so newcomers can get away with the odd error. A slip in the Boat Race, even for one stroke, can cost you the trophy. But coach Sean Bowden is very confident and explained earlier this week that Toby’s calmness under pressure is a trait he and the crew value highly. The women’s crews feel (though we could be wrong) less likely to clash, and here it may be more a battle of dogged determination and a desire for revenge (Oxford) against a higher level of international experience (Cambridge). Both Oxford crews have less experience overall, and athletes with a lower range of experience. Oxford’s women are better off here than their men in one regard: they feature 7 of the 9 who have taken part in the Boat Races before — either Blues or reserves — and have lost during the last two years. That can become a powerful motivation factor if you’re nearly a length down and need a reason to pull out the biggest move of your lives. Cambridge win on a woman for woman careers comparison, and have an interesting new coach, Rob Walker, who is clearly having to learn fast about the Boat Race’s peculiarities but comes from a US collegiate background and is well used to academic rowing duels.